Visitors to Kirkby Stephen are often surprised by a sudden loud harsh noise above them. No, I don’t mean the RAF’s jets screaming past. It’s a bird-like noise but not the kind you’d expect to hear from most native English birds. It’s harsh, grating, and it makes you look up suddenly. Those who are quick enough might catch a glimpse of green or gold as a large bird with long tail sweeps across the road to perch on a chimney pot. 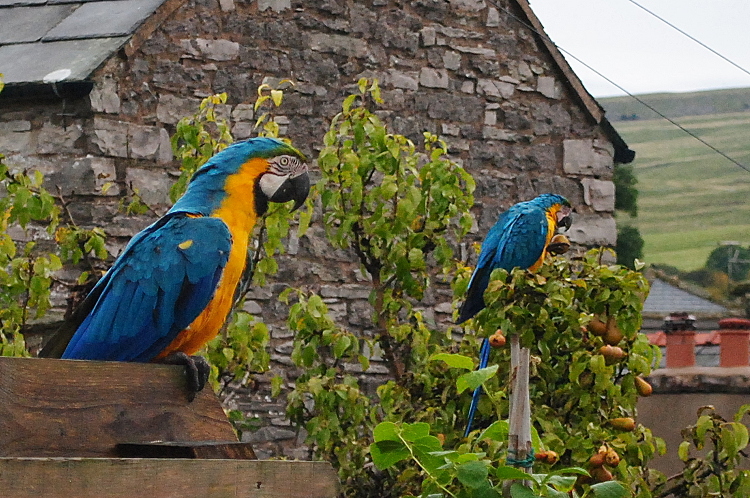 These are the Kirkby Stephen parrots and a couple of days ago I caught this quick shot through our lounge window, catching the culprits red-handed. Or should I say red-beaked? “Culprits” is the right word here too. The thief in the further distance had for the past five minutes been gorging on our neighbour’s pears.